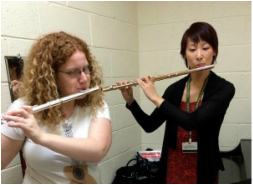 Lish teaches undergraduate and graduate flute students at New Jersey City University (20 minutes from midtown Manhattan) and directs the NJCU Flute Choir. She has taught Music in the City, a music appreciation class for non-music majors, and Form and Analysis for music majors. Lish is the adjunct professor of flute, and director of the flute ensemble at Wilkes University in Wilkes-Barre, PA (northeast PA). She has also taught Intro to Music, a music appreciation class for students looking to learn more about the history of music. She is the artist instructor of flute, Chamber Ensemble instructor, and Musicianship III professor at Mercer County Community College (near Princeton, NJ) in West Windsor, NJ. Previous courses taught include Musicianship II, Music History I: Antiquity to Baroque, and group piano classes. Lish joined the CUNY Brooklyn College Conservatory of Music (end of the 2/5 subway lines) as a Music: Its Language, History, and Culture lecturer and has multiple openings in her new flute studio (graduate/undergraduate) for Spring 2019 transfers as well as the following school year. Anyone interested in meeting for a free trial lesson at these school should email Lish directly. ​She can also be found teaching for the Ethical Culture School (NYC), and Wilkes University Conservatory (PA). Summer 2019 appointments include Summer Music in Tuscany (Italy) and the Pocono Flute Society Summer Flute Camp (PA). Lish taught the beginning flute class to music majors at The College of New Jersey, private lessons for Camden County Community College (NJ), and was a flute/private piano and group piano/recorder instructor for the Bronx House School of Performing Arts. She also taught for the Paramus Community Music School (NJ), the Conservatory of Musical Arts (NJ), Ferrwood Music Camp (PA), Musical Associates (NYC), LessonFace (Online), and the Pennington School, a private boarding school in central Jersey. Lish began teaching in 1999. Flute students have ranged from 4th graders to adults though students as young as 4 have taken piano lessons. Lish has experience teaching group piano class for students starting at 6 years of age. Lish is currently taking new students in all teaching locations and is offering lessons and coaching via Skype (privately or through LessonFace). Please email for more information and inquire about a free trial lesson. Helpful FYI for parents: Lish has passed background checks for all teaching locations/schools that involves teaching minors. "My daughter is taking lessons from Lish. Lish is a great teacher. She inspires my daughter and that is more than I can expect." -Young L.
"Lish, we are so delighted that we found you. Our daughter (10) has really enjoyed her lessons with you and her playing has already improved enormously after only three lessons! We think that you are a very gifted, "natural" teacher, and your ebullient personality and indefatigably positive attitude are huge pluses, as well. Keep up the great work." -Thom and Liz M.